Independence Day is next week! Even though it falls in the middle of the week, there is still plenty to do here in Northeast Wisconsin! Here are just a few suggestions of things you and your friends and family can do in the coming week in the Algoma area. Visit our member directory for more ideas and options to fill out your week! Crescent Beach in Algoma, WI (taken on June 28, 2018). 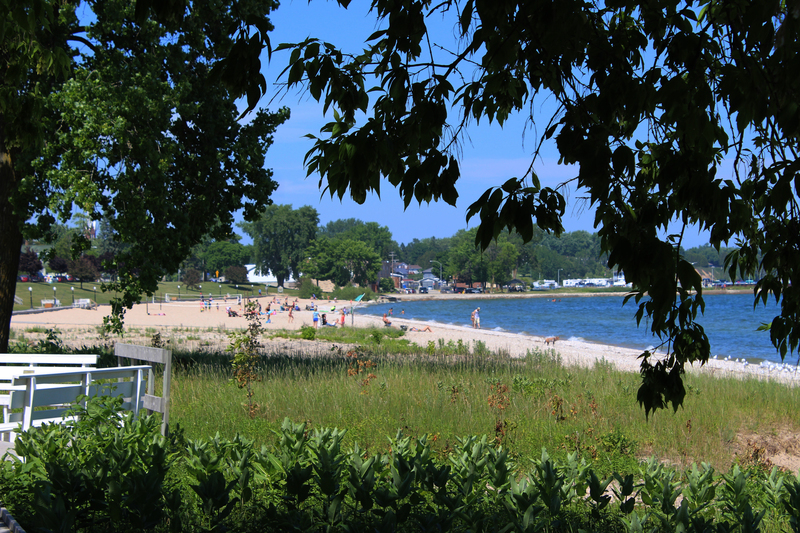 The sandy beach is free and open to the public from sunup-sundown. It goes without saying that you should go out on a Charter fishing trip. Give one of our amazing Charter services a call and see if there are any openings. If you are in town early in the week, give Renard’s Cheese on County S a call (920) 825-7272, to reserve your spot for a factory tour! Tours are offered at 8 a.m. Monday -Friday (reservations are required) but if you can’t make it for a tour, you can still stop in for free daily cheese and wine tastings! For some homemade goodies, stop next door to Weinke’s Market. Stock your pantry with fresh packed pickles and jams. From there head a few miles north on S then hang a left on Door County J and stop by Country Ovens for the BEST Door County Cherry products. Come back to Algoma on Route 42 and stop at Bearcat’s Fish House for the best fish and seafood products you can get! We are very proud of our specialty markets where you get the best locally produced food! On Wednesday, July 4, 2018, VIP’s 4th Annual Smokehouse Jamboree is being held at the Barnsite Retreat Center in Kewaunee. This is a family fun event featuring music, games, local artists booths, kids Karaoke, dunk tank, ball drop, silent auction, smoked meat plates and more. All proceeds go to The Violence Intervention Project which is a nonprofit organization that provides support services for victims of domestic violence and sexual assault in Kewaunee County. Stop in or spend the day! There’s a little something for everyone! This event runs from 11 a.m. – 4 p.m. at the Barnsite Retreat Center 109 Duval St. Kewaunee. After that, head north on Rt 42 and stop at Red’s Pub & Grill for some great food, and starting at 7, it’s Open Mic night! Red’s is located at N6318 State Road 42 Algoma. 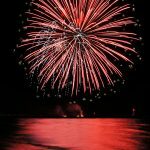 From there, head 2 miles north on Rt 42 to at Waters Edge, N7136 State Hwy 42, for Dave’s Annual Fireworks Show! The fireworks show starts around 9:45 p.m., and will be non-stop for approximately 45 minutes. Rain date is July 5, 2018. On Thursday, July 5, you can grab picnic supplies from Craig’s Piggly Wiggly or Denny’s SuperValu and head to Crescent Beach! There are plenty of picnic tables and benches so you can enjoy your lunch. Take a walk on the Boardwalk, dip your toes in Lake Michigan, or just relax on the nice, warm sand. If you’re ready for a refreshing beverage after that, you can do some free tastings and then take in a tour of von Stiehl, Wisconsin’s oldest licensed winery. Then stop next door at the Tap Room and try out Ahnapee Brewery‘s craft beers! From there head just down the street to Heritage Park, right by the Algoma Marina, for Opening Night of the Algoma Concerts in the Park! Two favorites are on the agenda – at 6 p.m. enjoy the Algoma Community Band then at 7 p.m., Big Mouth & the Power Tool Horns takes the stage! Grab your chairs and secure a spot in the grass. There is a playground on the grounds and you will enjoy an evening of music with scenic Lake Michigan as the backdrop! 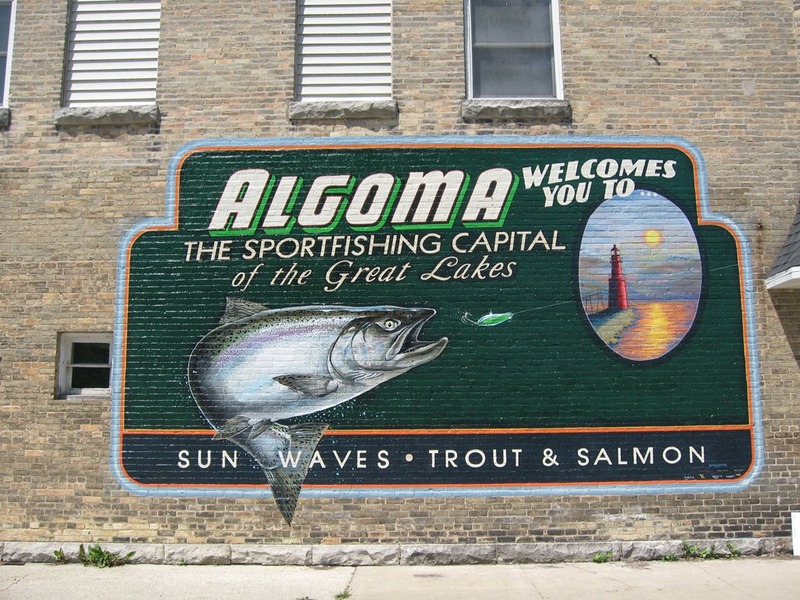 Take a self-guided walking tour of Algoma and view the historic WallDog murals. On Friday, July 6, 2018, stop by the Algoma Visitor Center and pick up a walking tour brochure then take to the town! On this self-guided tour, you can take your time viewing the WallDog Murals, learn about some of the historic buildings in town and stop in our shops and eateries while you are passing by! Parking is free and almost everything is within walking distance. Friday evening July 6 happens to be the first Friday of the month, which means First Friday Art in Algoma! Beginning a 5 p.m., enjoy the sights and sounds of Art in Algoma featuring special artists, opening receptions, literature readings, music and more! Visit First Friday Art in Algoma on Facebook for times and featured artists. On Saturday, July 7, 2018, head to the Rio Creek Airport Fly-In for a fun-filled day beginning with breakfast at 7:30 a.m., live music, antique car & tractor display, kid’s activities and airplane rides. Head back to Algoma where the Summer Concert Series begins at von Stiehl with the Annie Rose Band. This free event takes place on the terrace from 12:30 – 4 p.m. where you will enjoy a view of the Ahnapee River. Enjoy a glass of your favorite von Stiehl wine or craft beer from Ahnapee Brewery and you have the recipe for the perfect afternoon. Ahnapee Brewery will be featuring Sour Saturday’s in the Taproom starting at noon. If you want to head back south of town, Red’s Pub & Grill is celebrating 10 years with live music by Jeff Stoeger & John Shedivy from 1-5 p.m.! Top off the evening with some ice cream from Hunt Bros Pizza in Algoma or North Water Bakery. Sunday morning, July 8, 2018, you can visit our Algoma Sunday Farmers Market at Legion Park (2ndStreet) from 9 – noon. The special guest activity planned is the Packerland Kennel Club. Then maybe take in a game of golf at NorthBrook Country Club in Luxemburg or Alaskan Golf Club south of Algoma. You can also visit the Bruemmer Park Zoo, E4280 County Highway F in Kewaunee. The zoo is free and open at 7 a.m. – sunset year round. If it’s indoor fun you’re looking for, you can bowl a few games at the Algoma Pizza Bowl. If you’re coming in from out of town, check out our lodging options so you can stay right in the middle of all the action! These are just a few ideas for the fun things to do here in the coming holiday week. Visit our Calendar of Events to plan your visit for other times of the year as well! Whatever you do, we hope you have a great time making memories in Friendly Algoma!